In Palestine, the practice of “sumūd,” directly translated as steadfastness (Richter-Devroe, 2011) or persistence (Johansson and Vinthagen, 2014), has come to characterize the nonviolent everyday practices or resistance by Palestinians to Israeli occupation. 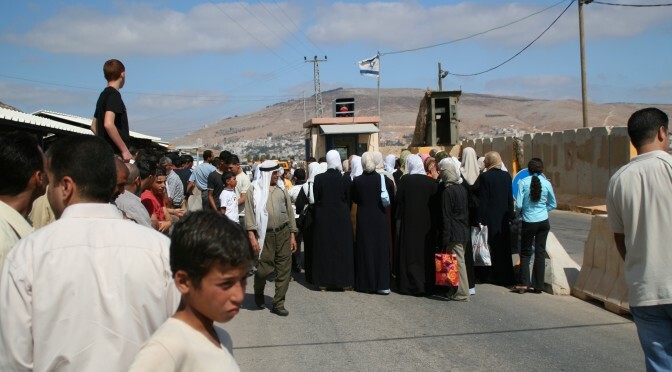 Specifically, sumūd is resistance to the planning practices of the Israeli state, including the creation of checkpoints, settlements, roads, and walls, which spatially confine or restrict movement of Palestinians. Given the changing nature of the occupation over time and across space, the term sumūd has inspired a variety of interpretations of what constitutes resistance; nevertheless, an ethos of staying ‘rooted in the land’ underlies all practices. Women stand near an Israeli checkpoint. Photo Credit: Michael Loadenthal Creative Commons Flickr. 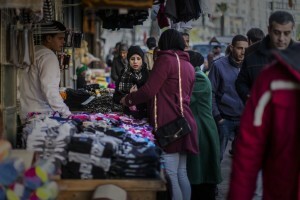 The everyday practices of sumūd by Palestinian women, in particular, has been described by as “a uniquely Palestinian tactic” whereby they seek to live with dignity despite uncertainty (Ryan, 2015). Practices of sumūd are often individual, covert, informal, and non-organized, and encompass a wide range of activities including upholding cultural traditions such as weddings and holidays; maintaining a sense of normalcy; engaging in micro-enterprises; passing on songs and folklores despite threats to personal safety and surveillance; and documenting the Palestinian struggle through writing, protest art and wall graffiti. Another tactic is for women to refuse to leave their country for better opportunities abroad, which is a particularly important symbolical counterpoint to the Zionist premise that Jewish people are the only rightful inhabitants of the land. On other occasions, women cross checkpoints despite potential violence or encounters with military in order to visit family members and go on trips. The uniqueness of sumūd is that, while the practices may be done in individual or informal small groups, most of the time it is not through a “centralized political strategy” (Johansson and Vinthagen, 2014, p.114). Rather, women’s sumūd are practices of the everyday, where daily acts can be better understood as resistance to a constant “state of exception” (after Agamben, 2005) (Johansson and Vinthagen, 2014), as Palestinians negotiate, manipulate and alter the ways in which their lives are restricted or structured by the occupation. Several authors refer to Scott’s (1985) notion of “infrapolitics” to describe the types of informal, non-organized resistance by women, where politics takes on a different form because of the oppressive nature of the situation. 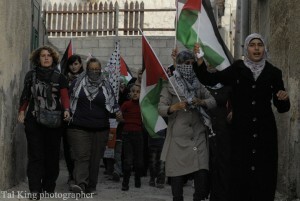 Palestinian women participating in a protest march. Photo Credit: Tal King Creative Commons Flickr. Concurrently, Asef Bayat’s (2000) concept of “quiet encroachment” is also useful in describing the practices under the umbrella of sumūd. From Bayat’s perspective, Scott’s work lacks a nuanced understanding of the various forms of resistance that people might engage in (including distinctions between individual and group-scale action), and also that it does not leave room for non-intentional activities that produce major changes in the lives of the agents. Instead, Bayat uses the concept of quiet encroachment to refer to those “fresh demands” that are made by the oppressed based through their everyday actions, rather than the forms of resistance that overtly deny impositions made by the oppressor. Bayat posits that 1) everyday practices can be understood as a response to the state, and that 2) these practices are often not a deliberate political act but rather emerge out of a necessity for survival. Practices of sumūd can be understood as examples both of Scott’s (1985) infrapolitics and Bayat’s (2000) quiet encroachment. While there seems to be consensus that practices of sumūd are generally non-violent and do not constitute overt, large-scale collective action, there is a wide range of examples from outward resistance to daily survival tactics that are described under the umbrella of sumūd. Here, assemblage thinking might be useful to conceptualize how such practices relate to each other, specifically because the practices are so dependent on when and where they are taking place and who is performing the action. 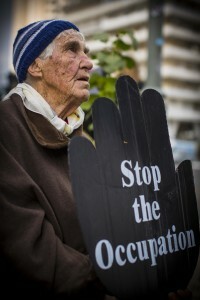 For example, resistance practices by women in the West Bank after the second intifada, or the second uprising in response to Israeli occupation, are described as very different than the practices pursued after the first intifada (Richter-Devroe, 2011). In this way, and particularly because the occupation is so tied to the land, the relationship between time, space, and agents of resistance is critical. Specifically, if we deploy Colin McFarlane’s (2009) relational concept of assemblage, we see how these resistance movements are not only composed of individual moments of (everyday or overt resistance) but also have emergent qualities as they come together across a given space at a given time. In Palestine, this fluidity is reflected in the shifting tactics of sumūd over time, and is reflective of the ever-changing spatial and physical impositions placed on Palestinians. Further, women’s practices of sumūd shed light on the importance of understanding various scales of resistance within planning discourse, specifically the scale of the home and the body. In contexts of severe violence, the “home” becomes an important site of both safety and resistance. In the case of Palestinian women, the home becomes a critical site for preserving “normalcy” for the sake of themselves, their families, and their children. While planners do not control what takes place within the home, how do we learn more from and accommodate this lived reality? Similarly, understanding how women literally embody resistance is not typically discussed in planning. In the case of Palestine, women choosing to wear the “hijab,” the head scarf, or short sleeves and sunglasses to not be recognized as Palestinian (Richter-Devroe, 2011) are examples of resistance acts where women are altering their body. For planners working in international contexts and truly committed to understanding how oppression is resisted by everyday practices, it is critical to examine various scales of resistance to better understand the oppressive functions and emancipatory potentials of planning. Indeed, the typical scales of neighborhood-city-country deployed in planning may in themselves be oppressive, requiring them to be deconstructed in order to examine how individuals become agents of resistance. What is Critical International Planning? A collaborative process of constant reimagination, reinterpretation, and revision. A creative rethinking of public spaces and human networks. A reconsideration and linking of bodies, mobilities, and space. Providing insights from different urban experiences and diverse regions. Complicating Western conceptions of truth and masculinist objectivities. Understanding everyday encounters to forge transformative practices. Self-reflective practice rooted in people’s local knowledges. Practice based on understanding how societies are bound up together. This site is a project of the Graduate Program in Community and Regional Planning at the University of Texas School of Architecture. The case studies presented on this site were prepared by graduate students as part of a seminar course dedicated to critical perspectives on international planning, focusing in particular on planning in contexts of urban informality. As the course continues to be offered, the number of cases presented here will grow.